How does it feel to see SUPER PIGMENTED lipstick in ONE swipe (applied with least pressure)? I've found them, when I attended Maybelline's The Loaded Bolds Mattes Launch a couple of weeks ago. Every Beauty Blogger understands how important it is to own at least One BOLDEST Lipstick for that bold statement. I remembered considering Mac's Pink Nouveau and Mac Ruby Red as my Boldest lipstick almost a decade ago! Today, I was able to pick my favorite The Loaded Bolds Mattes Lipstick from one of my favorite drugstore brand --- Maybelline. And that's not the wildest shade from the collection! Can you spot the White, Blue and Black? 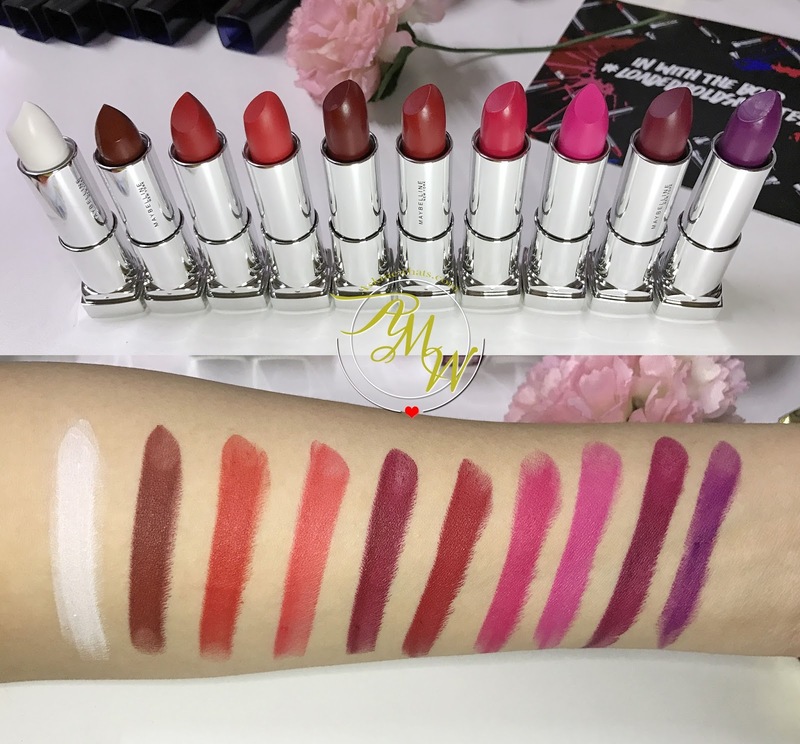 There are a total of 12 shades in this collection, 2 of them are fresh from the manufacturer so I believe we'll soon get all the shades in stores soon! And we were there to chat, appreciate each new LOADED BOLDS MATTES Lipstick shades and played with the "Instagrammable" display. And of course, catch-up with Maybelline PH Team and fellow Maybelline Squad for upcoming launches! Something exciting is happening for the brand --- more Brow Products coming in PLUS Maybelline FIT ME products are arriving our shores! Watch out for it this coming June 2017! What's your favorite Loaded Bolds Mattes Lipstick shade? Powder mattes and now this Bold mattes! Maybelline has always something new to offer. I'm more excited about the FIT ME foundation. For sure this will be a hit too! Another sure hit from Maybelline. I like the Chocoholic shade.